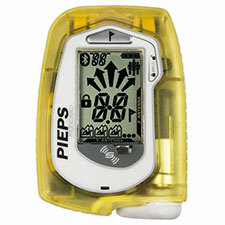 With its new Micro avalanche beacon, Pieps have added a genuine innovation to what would otherwise seem to be a fully-mature technology space. The Micro isn't just a remarkably small and light 3-antenna DSP beacon (and a good one, at that); it is a very different beacon in terms of how you use it. It is the Micro—and not the user—that decides, via the interaction of algorithm, motion sensor, and proximity sensor, when the beacon is in search or transmit mode. That initially struck me as not only revolutionary but also potentially quite dangerous. However, after operating the Micro both in constructed tests and actual field use, I've really come to admire the intelligence of the Micro's design. Here's how it works: the Micro knows when it is in either its harness, or inside a pocket. When that's the case, the Micro automatically goes into transmit mode. Pull the beacon out, and it immediately goes into search mode (this works, by the way, whether or not it is dark outside). As with many paradigmatic shifts, this is a deceptively simple one. Once I wrapped my head around it, I loved it. And then I started wondering about possible negative consequences. What happens, for example, if in the middle of a search a party member absentmindedly slips their Pieps Micro back into a pocket? As we all know, rescuers mistakenly switching to transmit can be a big problem in group rescues. Well, Pieps has thought about that, and in fact when the beacon first comes out of your pocket, it "locks" in search mode. Put it back into your pocket, and it stays in search mode. Great! you say. But what if a rescuer is buried by another avalanche. Is the Micro then uselessly stuck in locked-search mode? No—the beacon assesses how long it has been inside the pocket (or carry harness), and also how long it has been motionless, and then decides whether or not to go back to transmit. It's an impressive bit of logic. The Micro is different enough that you do need to familiarize yourself with how it operates (you should of course do this with all new beacons). The Micro uses not only audible but also tactile cues to tell you when it is switching modes (it vibrates), and which mode it is in. You'll want to know what these cues mean, as they work to reinforce which mode you're currently in. It sounds complicated, I know, but in actual practice, operating the Micro is remarkably simple. In fact, along with the Micro's next-gen DSP, I found this to be one of the easiest-to-use and fastest beacons I've ever tested. That would include effortless marking for multiple-rescue scenarios, and exceptionally good signal processing to deal with ghosting and/or challenging environments. Via the Micro, I think Pieps have made a very strong case that the decision of when to enter or exit search mode should indeed be left to the beacon, and not the user. That said, let's remember that this is a new way of doing things, and it is possible there remain unanticipated scenarios and/or consequences that will vex the Micro's design. We'll want to watch closely for reports of how the Micro does, over time, in actual rescues. Conditional on that, I give the Micro a hearty recommendation—I intend to purchase one to use as my primary beacon. In terms of size, speed, and ease of use, nothing else out there compares.